LG electronics has recently announced a new addition to their wide range of cell phone, the new LG GD510 Pop with attractive design and multiple user friendly functions. This amazing compact cell phone from LG comes with a brilliant touch display screen of 3 inches of type TFT and resolution of 240 x 400 pixels. The 256k colors capacity of the display provides the users with remarkable clarity. The screen features a virtual full QWERTY keypad and handwriting recognizing capability for faster, secure and smoother text entry. The LG GD510 Pop comes with a 3.15 mega pixel built in camera with features like adjustment of light effects, auto focus and various effects to enhance the image quality. The image features a high resolution of 2048 x 1536 pixels. The phone also features a video recording capability for capturing and sharing the un-forgetful memories. The LG GD510 Pop is available in stylish Silver color sleek body which makes the cell soothingly portable to carry. 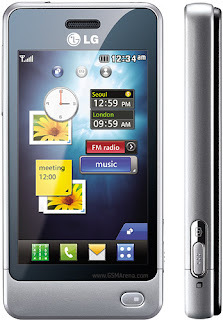 This hi-tech cell phone from LG electronics is expected to hit the markets in October 2009.